On Sunday we drove with our friend Adrian to the small, historic town of Oatlands, 87 km north of Hobart, to see the celebration of the opening of a recent (over the past 6 years) restoration of a windmill that was originally built in 1836. 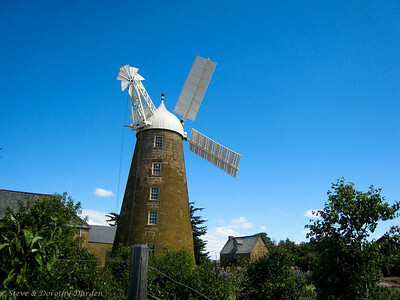 It stopped producing flour when its sails were blown into the nearby lake by a storm, and since 1891 the Callington Mill was foreclosed and abandoned. The tour of the mill was very educational, as we climbed four flights of stairs to the top level where the main shaft exits the cupola to the enormous blades and sails and then we followed the path of the grain down to the flour sacks on the ground floor. Metal gears bearing on wooden cogs transfer the wind power to rotate the two large grinding stones. A small circular set of sails forms the fantail, which keeps the large sails facing into the prevailing wind. The original miller’s house, granary building, stables and other sandstone buildings, built by convicts, are still standing, and have all been restored. The group of enthusiasts that organized and promoted the mill restoration has a blog that includes lots of photos of the restoration. Click the thumbnail above for the passage gallery. We have sailed back to Tasmania, seven years after sailing east for Alaska in 2003. 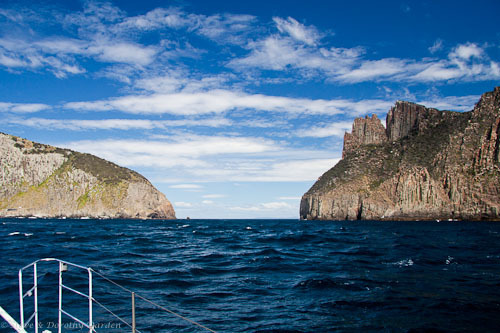 When we rounded Cape Pilar the weather was stunning and the sea state mild enough to navigate ADAGIO through the pass between the Cape Pillar and Tasman Island. This is our sixth Bass Strait crossing, but only the second time we’ve assessed the sea state to be favorable for taking this short cut. This was an extremely easy trip, departing Eden on 4 November, anchoring at Maria Island at 0006 the morning of the 7th, then berthing at RYCT for sunset on the 8th. We had light-moderate headwinds for the first two days, so in the slight seas we made good progress under jib and full main. Then the wind backed and lightened until we were motorsailing on the port engine. Meanwhile we were continuously entertained by visiting albatrosses. Photographing dolphins requires a high ISO, and a “sport” or “motor drive” setting. We had our old Canon SLR set up that way – but with 300m telephoto in case we found some more breaching humpback whales. That lens was too long and we hadn’t yet unpacked our just-repaired 17-85mm lens, so we just grabbed the trusty old Canon SD800 shirt pocket camera. The dolphins exhale while underwater then quickly surface to inhale a breath of air. That’s when you can grab a quick photo of their face. It requires quick responses and practice to anticipate when a dolphin will surface, so that your photo contains the dolphin’s face and not just a splash. I tried following one dolphin and timing the breaths, and caught some good shots, but this caused me to miss out on photos of other dolphin actions, like jumping out of the water. We can understand the myths and legends which sailors developed around these fun sea creatures. Their lives appear to us to be carefree and exhuberant, and I hope you can see these qualities in the photos. When the seas are the roughest, the winds are the best for the magnificent Albatross. As we sailed south from Sydney towards Bass Strait, ADAGIO was circled by two types of Albatross: the Black-browed Albatross and the Shy Albatross. I learned from my Field Guide to Australian Birds that the Black-browed Albatross is identified by its short black brow which gives it a frowning, penetrating expression. The immature bird has a pale gray neck collar and wide, silvery colored stripes the length of its dark underwings. 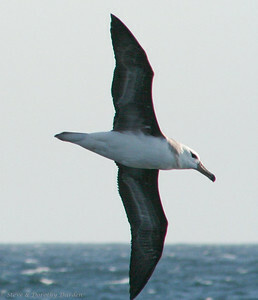 On the other hand, the Shy Albatross is larger and the feathers on its underwing are white between equal, narrow black edges. The bird is very long winged, with a massive bill. This is the only Albatross to breed in Australian waters and breeds only within the Australasian region. 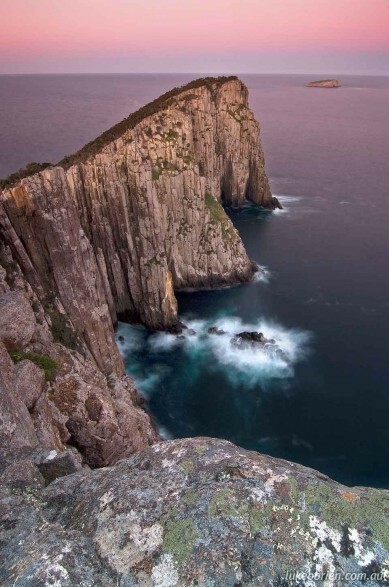 It is commonly seen around Tasmania. We watched the Albatross utilize the lift and energy of wind across the tall waves of the ocean, soaring effortlessly, rarely flapping a wing. Occasionally a bird would momentarily disappear behind a wave with only a wingtip visible. I understand that these birds are able to essentially latch their outspread wings, so that they utilize no energy holding their wings straight. It was a beautiful day at sea as we sailed south from Coffs Harbour towards Sydney. A large humpback whale came to the surface and blew! off our starboard quarter. Later about 7.4 nm east of Nambucca Heads, two whales surfaced just off our port bow. We stopped the boat as they dived to make sure we did not get too close to (we think) a mother and calf. For the remainder of the passage we sailed about 20 nautical miles offshore to avoid running into whales during the night. We sailed under our wonderful reacher sail, with a following wind and following sea. We were receiving a 1.5 to 2 knot boost from the East Australian Current. The western sky performed magnificently before sunset. The full moon rose in the east, peeping out from behind pinking and blue-gray clouds. That night we enjoyed just about perfect broad-reaching conditions with TWS around 17 kn until 0400 when the puff went out of the wind. At sunrise the burning sun ignited the sky as it rose above a night-dark sea. After lunch, convection and rain clouds covered the land to starboard, and the barometer was falling. We sailed past two albatross sitting on the surface of the sea, waiting for the wind to blow. 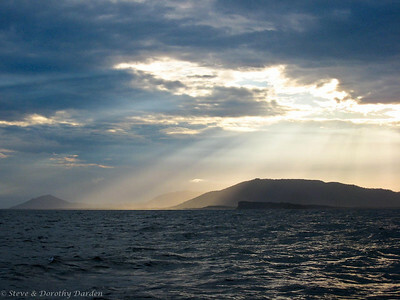 About two hours before sunset, we set our anchor in Refuge Bay, off of Cowan Creek in Broken Bay, north of Sydney. It was a beautiful passage. 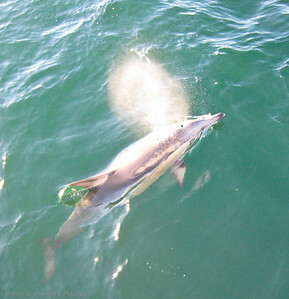 Short-beaked Common Dolphins joined us as we sailed south from Mooloolaba. 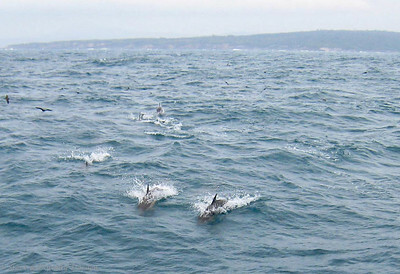 The typical group size is 20 to 30 dolphins, but they can occur in groups of a thousand dolphins or more. They feed cooperatively and are the most commonly seen dolphin in coastal waters. We are always happy to see them.